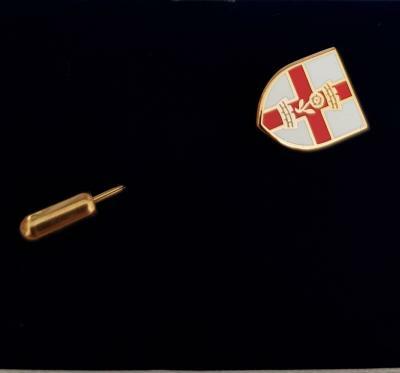 We offer a range of gifts and practical items, available exclusively by mail order from the Guild Office or at our Joining and Welcoming Ceremony for new members. We can also bring small items to Guild events to deliver them to you in person. Jewellery is supplied with a presentation box. Items are dispatched within two weeks of receipt of order, except where indicated. Prices include packing, postage within the UK, and VAT. For overseas or signed for delivery please contact the Clerk for a quote. 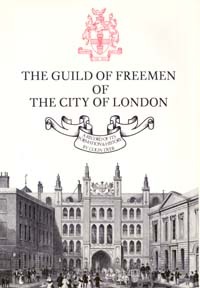 "The Guild of Freemen of the City of London" was published on the 75th Anniversary of the foundation of the Guild, in Sept 1983. It was written by Past Master the late Colin Dyer and traces the fascinating story of the formation of the Guild through to modern times. Hardback, 194 pages. "A feast of nostalgia - expensively printed, but moderately priced - a treasure." (City Recorder). Covering the years from the 75th Anniversary in 1983 to the completion of the Centenary Year 2008/2009, this superbly illustrated book, written by Past Master Raymond Holl, focuses on the people and those organizations that have been and remain an integral part of the Guild's activities. 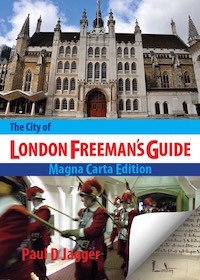 The definitive concise guide to the City’s many ancient customs, ceremonies, traditions, institutions, office holders and landmarks as they are to be found in modern times. Aptly described as ‘The Wizard’s Guide to the Land of Oz’ this book throws open the gates to the wonders of the great and famous City of London! The book is now available from the Guild office at £12.50, inclusive of postage and packing. 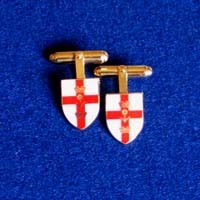 This traditional cufflink comprises a shield showing the Guild’s crest in enamel and has a toggle fitting. These cufflinks are hallmarked silver gilt. 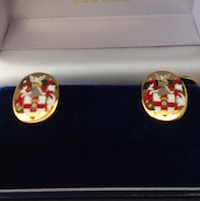 This traditional cufflink comprises a shield showing the Guild’s crest in enamel and has a toggle fitting. These cufflinks are in gilt metal. 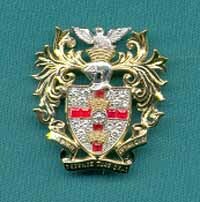 A neat tie tack of the shield of the Guild's Arms in hallmarked silver gilt with red and white enamel. 1.6cm height, the tie tacks have secure clutch fitting with chain and bar to hold the tie neatly and handsomely in place. 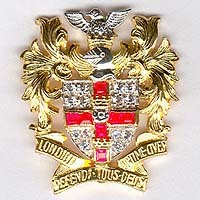 A neat tie tack of the shield of the Guild's Arms in gilt metal, with red and white enamel. 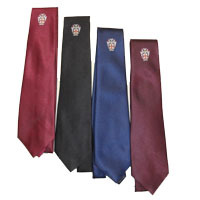 1.6cm height, the tie tacks have secure clutch fitting with chain and bar to hold the tie neatly and handsomely in place. Tie tacks can also be supplied in 9ct gold. Prices on request. 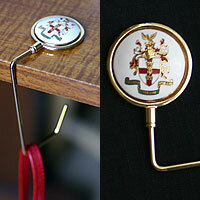 This stickpin, dispaying the Guild's crest in red and white enamel, is a wonderful versatile accessory for men and women. 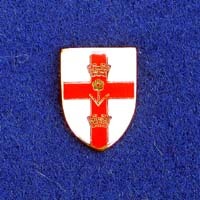 The decorative shield is approx 1.6 cm in height and is supplied in an attractive presentation box. A delightful, delicate brooch cast in hallmarked silver, gilded and generously set with cubic zirconia and synthetic rubies to highlight the shield. The height of the brooch is approximately 3cm (1.25inches). A very popular and graceful brooch, ideal for evening and daywear and as a gift. This brooch is now supplied with a pendant fitting as standard to enable it to be worn with a neck chain. 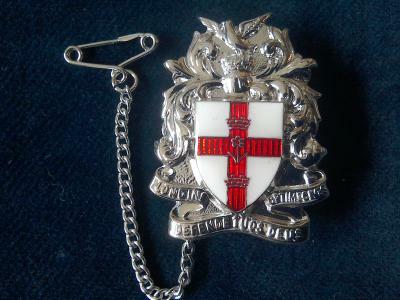 This beautiful Rhodium plated brooch features the Guild's crest in red and white enamel. Supplied in a presentation box, the brooch is approximately 3cm (1.25 inches) high and has a detachable safety chain. An enticing new addition to our range of Guild Jewellery. Crafted in Hallmarked 18ct gold, beautifully hand worked, the shield is set with diamonds of about 0.42ct total and rubies about 0.56ct total, this superb brooch is approximately 34mm in height. An outstandingly attractive and distinctive brooch which will be a most acceptable gift for a birthday, anniversary or celebration, it will also be a delight to wear and to behold. This box has been specially designed and made to commemorate the Guild's centenary. It portrays the Guild's coat of arms on the lid, the inside of the lid carries a commemorative inscription and the base of the box is plain red. It is a classic Halcyon Days design, and, as it is being made in a limited edition of 300, with each box individually numbered on the base, it will undoubtedly be a collectors' item. 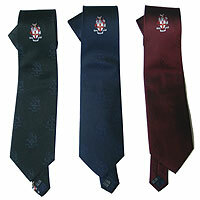 For formal occasions this silk tie has a choice of Black (sorry sold out), Wine or Blue, with the coat of arms in heraldic colours in a central position and multiple representations of the coat of arms in shadow weave throughout the tie. Gilt metal hooks designed to rest on a dinner or bar table and hold a lady's handbag. 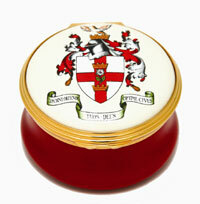 With the Guild's coat of arms in coloured enamel, supplied with pouch. Length approx. 5 inches (13cm). 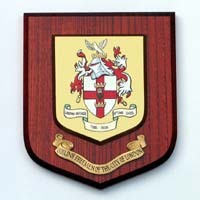 The coat of arms is individually hand-painted on an embossed shield and mounted on a solid wood base. Size is approx 6 inches wide by 7 inches (15cm by 18cm). 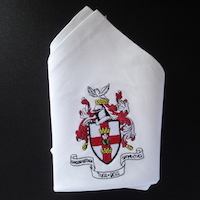 These are superb quality white linen napkins (56 x 56 cm approx.) 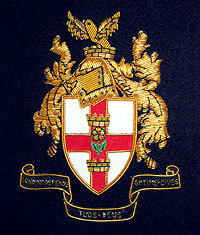 with the Guild’s coat of arms embroidered in full colour on one corner. 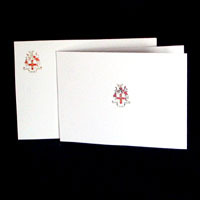 Pack of 12 white cards with the Guild's coat of arms printed in colour in the centre on the front, and with a simple festive message on the inside ("With Best Wishes for Christmas and the New Year"). Cards are size A6 (14cm by 10.5cm) and are supplied with matching envelopes.